But such declarations are almost always submitted by an Agency head–that is, someone outside of the White House. Yet here, the White House is sufficiently determined to keep this very short phrase secret that they had the NSA write a declaration on top of what Panetta had already written. NSA Jones’ declaration may indicate that the National Security Council has more ownership over this program than we’ve understood. We’ve already seen hints of that in the way the program was made a Special Access Program. In her January 5, 2007 declaration supporting the withholding of the September 17, 2001 MON I believe is at issue in this case, CIA Information Review Officer Marilyn Dorn claimed the NSC told CIA to make the torture program a SAP. In accordance with the NSC’s direction to the CIA to establish a special access program for information relating to the CIA terrorist detention and interrogation program, the CIA is charged with strictly controlling access to the information contained in the [MON]. Leon Panetta offered a slightly different version of what happened in his June 8, 2009 declaration. Section 6.1(kk) of the Executive Order defines a “special access program” as “a program established for a special class of classified information that imposes safeguarding and access requirements that exceed those normally required for information at the same classification level.” Section 4.5 of the Order specifies the U.S. Government officials who may create a special access program. This section further provides that for special access programs pertaining to intelligence activities (including special activities, but not including military operations, strategic, and tactical programs), or intelligence sources or methods, this function shall be exercised by the Director of the CIA. So in 2007, while Bush was still in office, the CIA said NSC told CIA to make the torture program a SAP, and CIA obeyed. In 2009, when Obama was in office, the CIA said that “NSC officials” actually made the SAP, not the CIA. And Panetta provided that explanation after acknowledging that the CIA Director is the one who is supposed to make SAPs for intelligence programs. There’s one more curious detail about this, which I laid out here. It at least appears that the torture program wasn’t treated as a SAP when first initiated in 2002. We know, for example, that the cables from the Thai black site back to Langley were originally classified Secret, and only classified Top Secret in 2009, when the ACLU started FOIAing it. 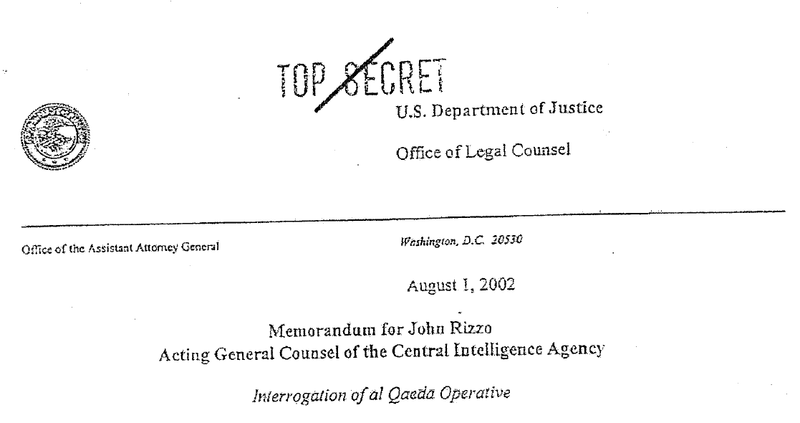 Best as I can tell, those discussing the torture tapes were doing so in cables classified Secret as late as December 20, 2002 (see PDF 20; there are, however, some cables from earlier that were later forwarded under Top Secret designation), with the first document reflecting a compartment dated January 9, 2003 (see PDF 24). … with the George Tenet memo at issue in this dispute. That one does appear to have compartment information to the right of the Top Secret mark. Mind you, we know that only a very limited set of people had access to what was really going on. And at least according to John Kiriakou, the CIA was telling a false story even to people within the Agency (which is why he claimed waterboarding worked so well). In other words, the folks involved in the torture program were treating it like a compartment, but it appears not to have formally been one yet. And, as least as Leon Panetta tells the story, the NSC–not the CIA–made it a SAP. There’s one more detail about Jim Jones’ declaration of note. His declaration was never formally noticed in the FOIA suit docket. Best as I can tell, the first public notice of it came when Hellerstein released his ruling requiring the government to release either substitutions or the actual language in the phrase; in it, he described referring to the Jones and Hilton declarations. In that order, Hellerstein rejected the government’s attempts to keep the language about the authorization for torture secret, requiring either that the language itself be revealed or substitute language he provided. Faced with an order to release language describing the authorization for the torture program, the CIA found new factual developments to urge Hellerstein not to release a very short phrase describing who or what authorized the torture program. Ultimately, Hellerstein found that new information unpersuasive, and–after a several month delay period requested by the government–on October 1, 2010, ordered them to release the language, with a stay pending appeal. v) It was reported that at some stage during that further interview process by the United States authorities, [Binyam Mohamed] had been intentionally subjected to continuous sleep deprivation. The effects of the sleep deprivation were carefully observed. Mind you, the British High Court first made it clear to the British government it intended to release that language on October 26, 2009, just around the time Jim Jones was submitting a very rare NSA declaration in support of a FOIA exemption. Now, I think Obama’s unwillingness to release proof that President Bush authorized the torture program, particularly that torture that took place–as some of Mohamed’s did–before the Bybee declarations gave them OLC cover, may be just one of the reasons why the Administration is going to such lengths to keep this short phrase redacted. But I do think it a significant one. To dovetail your posts on this with Jeff and Jason’s piece on reverse engineering is groundbreaking, in-depth journalism of the highest quality. 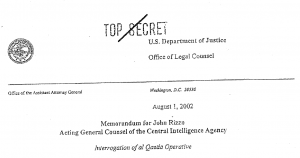 Could John Brennan have had a role in the drafting of the MON? Who in late 2001 had the job in NSC that Brennan now has under Obama? @lysias: Possibly–as I’ll hit on briefly in my next post, if I remember it. By that point he was Deputy Executive Director, no longer Tenet’s Chief of Staff. But Cofer Black did have a significant role in it. Ironic that Sept 17 plays such a role in the US. Sept 17 2001 Torture Authorization. And, Sept 17 is my birthday. I used to be proud. Now…..
One motive for keeping the exact words secret would be if the words were false, part of a lie or coverup. What if the exact words pointed not to the expected Bush, but to a “shield” entity erected to deflect legal blame from the president? NSC, CIA, VP? If the VP were to hold a security portfolio, he might be a (delegated) source of Authority, to shield the President from legal repercussions, and do things a President isn’t legally or popularly allowed to do. Circumstances like this would provide a motive to continue to hide the exact words. @tjallen: True. Although that’s already baked into this. 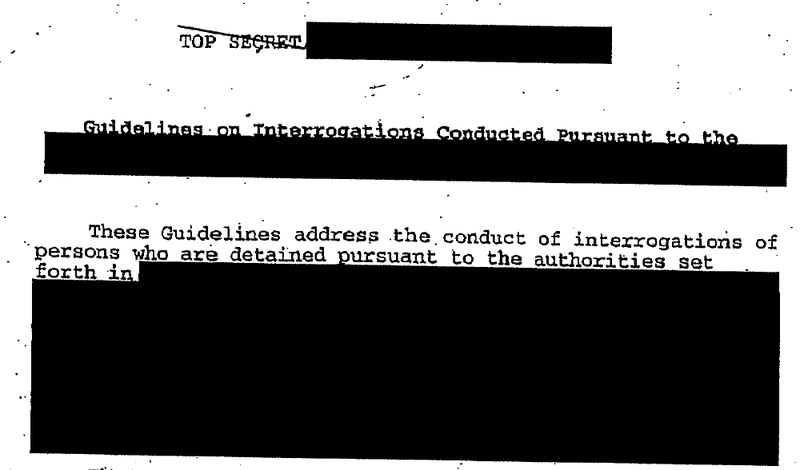 CIA says the MON authorized torture. But there’s no written record of it, and the briefing CIA did to Congress doesn’t reflect it. Mind you, in his memoir Tenet is careful to name all the people at his briefing: from the CIA, COfer Black and John McLaughlin. As well as Colin Powell, Cheney, Rummy, Wolfie, Condi, Hadley, Armitage, Ashcroft, and Mueller. This is exactly the EW weedwacking we’ve all come to applaud. I wonder if National Security Advisor Jim Jones’s declaration from the Obama Administration reflects a decision to protect one of his predecessor’s in that very same position. Namely a flunky called Rice. @MadDog: Nah, it’s about Bush. Definitely note Condi. Possible Cheney. But BUsh. Which is the irony: when Brent Scowcroft wrote the declaration, guess who was (I believe) CIA Director, the guy in charge of the FUBAR attempt to recover a Russian nuclear sub? Wow. Wow. Wow. Thanks! Great weedy blog. I’m loving this series of posts.